I then switched it to a 1500 W load. The AC amps in went up to 9.90, again way above the 5 amp max. The battery voltage had gone down to 11.6 v or so. How are you determining that the AC amps went to 9.9? Are you reading that from the mate or from a kill-a-watt? Also, what type of 1500 watt load? (resistive, inductive, reactive, other)? I have a break out adapter in the AC input line with a clamp on amp meter , the load was a space heater with a 900 watt setting and a 1500 watt, so it's a resistive load. Alright , I got 2/0 cables hooked up, got the generator out and ran a ac line to the inverter. The test was to run with the ECO ON. That's the real test of what you can expect, if it'll run with that on you should be able to run about anything up to around 26 amps AC + / -. The inverter is 1300 watts + 1600 watts from the generator if they both put out their continuous output. I'd like to give as many details as can so you would expect to have the same outcome. Fired up the Generator ( 15 pulls ) let it stabilize and plugged the power cord in. Tested the voltage = 127.3 volts. Plugged in the heater and with a amp meter on a breakout adapter, the 900 watt setting pulled 7.3 amps AC , the 1500 watt setting pulled 12.10 amps AC. Turned the Inverter on and plugged in the AC, it qualified it and the charger kicked in pulling 5 amps ac ( that is what I set in the mate ) It started dropping and it hit 2.3 amps ac still charging when I started the load. I hooked to load to the inverter, on the 900 watt load the Generator amp output went up to 5.16 amps AC and was stable, the battery voltage was 13.2 v DC. I then switched to the 1500 watt setting. The amp load on the generator went up 7.48 amps AC and the battery voltage dropped to 12.11 V dc. I then dropped the load completely off. The generator then dropped to 5.23 amp AC output and the Inverter charger started bulking back to the batteries. So in conclusion it WORKED and very good. The Generator's transitions were smooth and not even noticeable. I saw no reason to do it with the ECO off. The way I saw it. 900 watt load Generator supplying 5.16 amps and Inverter supplying 2.14 amps for a total of 7.3 amps. 1500 watt load Generator supplying 7.48 Amps and Inverter supplying 4.62 amps for a total of 12.10 amps. Load Sharing in Generator Support is real and workable on the Honda EU 2000 with the GFX 1312 it seems like a great combination for small RE or if you need or want Generator Support. I'll get it into a real life loading later this spring and if anything changes I'll let you know. The GFX 1424 or the GFX 1548 should work just as good and gives you voltage options. I still have concern if the charger will put out a sustained 70 Amps DC, that I have to do later when I have a good size bank. Even that should have a workaround by putting on a Vented top part of the case so you have a fan. If you want information from the Mate, I am not savvy on it yet. Excellent work. Thanks for doing this and sharing the results. Load Sharing in Generator Support is real and workable on the Honda EU 2000 with the GFX 1312 it seems like a great combination for small RE or if you need or want Generator Support..
Yep, that confirms what I found with my GVFX 3648 and my EU 2000s (as I have mentioned in other threads). Hopefully this will finally put a nail in the coffin of the myth that Outback inverters can't do generator support. Clearly some can - just not all of them. The "G" inverters have this ability. Unfortunately since they are marketed as "grid interactive" I think the off-gridders who would really benefit from this feature often don't consider them. In contrast Xantrex XWs are also "grid interactive" inverters which are often used off grid. IMO Outback really has missed the boat with their poor marketing and documentation of this features. As Chris Olsen has correctly pointed out this is a really useful feature which can allow someone off grid to have a more efficient and cost effective system - smaller battery bank and smaller generator..
One more little comment, the GFX series does NOT have a Neutral to Ground bond. 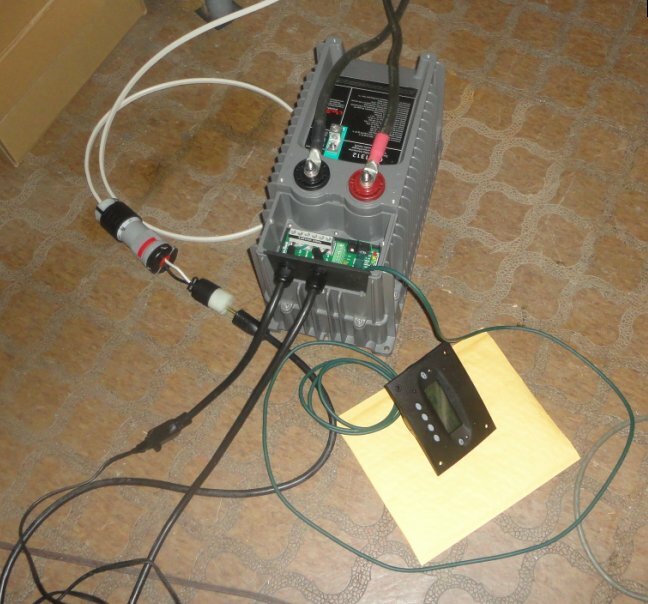 If used Off-Grid ( some ) and with Mobile you need to add a N/C relay to give you the bond, power the relay off the input and make the bond to the output N+G. then when you have AC input it will open and break the bond. The Honda EU 2000 has NO bond so you would need to create one. Are you saying that when the grid is dropped the G inverters do not bond neutral to ground? If so wouldn't that cause problems when the grid is down? How do other grid interactive inverters (e.g.xantrex xw, SMA sunny island) do this? They do it internally with the main relay. This not a big deal. When the inverter is inverting, it should have the ground / neutral bond. This being a grid inverter you should already have that in your panel. In Mobile you wouldn't and in a stand alone off-grid you might not. If your on-grid you should be ok cause you don't want two. That is why I think gen support is of very limited usefulness for most off-grid folks. If your load is just a bit larger than your generator can handle, gen support is a good thing. If your load is much larger than your generator can handle, but very brief, gen support is a good thing. But in many instances the load on the batteries from trying to provide gen support is just too much for the batteries. Chris mentioned earlier in this thread that one should keep their battery bank on the small side, and that gen support allows one to get by with a smaller battery bank. I just don't see that. If the battery bank is small it just can't provide very much gen support. Maybe your right, 2 batteries are not much to test with and I saw them at 11.6 yesterday, so I figured 55 amps extra wouldn't hurt. Next time I'll try 4 GC-2's that seems more reasonable. Bottom line the results would have been the same, just with a lower battery voltage. I didn't want low battery messing up the test. Consider this is specific equipment, you have to have a Inverter and a way to charge and if you have Honda, why not spend your money with something that can actually work together ?? Next, anyone with a Honda can tell you the pain in the backside is running in and out turning the ECO On and Off. Understood. Yes my service panel has N-G bond and I realize you don't want 2- but you had me worried - since I can have long grid outages at times (essentially becoming off grid). I posted that out of a safety concern that someone might read the post and not understand the difference in a Grid Inverter and a Mobile Inverter . Besides I got a warning once from a Moderator not to encourage posters to do unsafe things. I agree !! The thing is there are many examples, as you point out, where it is very useful. For example when the grid is down for me, my inverter is large enough to supply all our normal loads. BUT - our septic pump draws very high current for short 30-60 seconds a few times a day - if this happens when I have the eu2000i hooked up to help charge batteries - without gen support my generator would become overloaded. So without gen support I would need to have a larger less efficient generator. Also - if I wanted to run a few high loads simultaneously from my inverter for an extended time (eg run clothes and dishwashers at the same time) and have enough inverter power left over if the septic comes on - I can do this by running the eu2000i. Without gen support I would need to have a larger inverter to do this. So it provides flexibility I would not otherwise have with a smaller inverter and allows me to run a small, fuel efficient generator. Based on the comments I see from many new posters here and on other RE forums - it seems like there are a lot of off grid folks out there buying oversized, fuel inefficient generators and/or oversized inverters just so they can support occasional, brief, high loads. 99% of the time they are wasting fuel unnecessarily with an underloaded genset and buying larger inverters than they should need. Maybe somewhat of a misunderstanding. I'm not advocating having an overly small battery bank. But in our example, we have 1200 ah, or about 58 kWh of battery power. We can run huge loads that normally only people on grid power are going to be able to run with a small 4 kW generator that is way more efficient than a large one when used for battery charging. If we had to buy the batteries and extra inverter power to run the stuff we run, without generator support, it would entail at least another $22,000 spent on our system in battery capacity and dual inverters. We started out with dual SW Plus 4024's, and after I figured out how generator support works, and how to use it, found that we can power all of our loads with a single slightly larger inverter and a SMALLER generator than what we had. That has provided a lot of fuel savings for us, and only half the equipment required to get the job done. That's the advantage of generator support. You still have to have a bank sized so the inverter can supply its portion of the load. But when you compare that to what it would cost to have a bank that can power those big intermittent loads standalone, it equates to big money saved on batteries. Batteries the most expensive expendable item in an off-grid system. And if you want to improve your quality of life off-grid, and enjoy having some of the things that most off-grid people think you can't power, generator support works without breaking the bank to have those things. Consider a Small 12 volt system 12 volt and a Honda EU2000. If you have a straight Inverter say 1200 watts, and 6 GC-2's. With a Honda you can run a 50 to 75 amp charger ( $300 ) you can only run the Honda 13.5 amps AC or the Inverter 10 Amps AC. The charger is going to use between 8-13 amps AC. If you have a inverter with a transfer switch. You get only the Honda and the amps consumed by the charger. The Inverter is cut out, you can't use both at the same time. Enter the Generator Support Inverter. The Honda is hooked direct, The Honda can now split it's output between battery charging and direct load support without any conversion losses. The inverter is always there to augment the load demand greater than the Honda could supply if it was by it's self. The system is a no brainier, you get the best of both worlds at almost the same cost, maybe even cheaper, the operating costs will be a whole lot lower. Yep, that confirms what I found with my GVFX 3648 and my EU 2000s (as I have mentioned in other threads). Hopefully this will finally put a nail in the coffin of the myth that Outback inverters can't do generator support. I think it might depend on whether or not Outback will support it. When we started looking for a suitable 48V inverter and told them we wanted one with generator support they flat out denied that the "G" inverters are suitable for off-grid use with generator support (except the GS8048 Radian). So while it may work with some inverters and generators, whether or not it works good enough for everyday use in an off-grid situation remains to be proven, being that Outback does not recommend it. And it is noted in the manual that they are not designed to be used with generators. I suspect that's because the "G" inverters could try to "sell" power to the generator, and backfeeding an AVR or inverter generator will wreak havoc with it. This little GFX being talked about here is pretty cool. It looks like it's not as "picky" about what sort of input it has as compared to the bigger ones that Outback told me are designed ONLY for grid input. And that little GFX is perfectly sized for most small cabins that usually don't have heavy loads, but might run a well pump from time to time that would otherwise overload it. So all of the information provided by Blackcherry04 is some really good stuff because it's one more inverter that can be added to the rather small list of off-grid units that have generator support. I hope someone tests a bigger one, my problem is I want to go smaller. I got a 3000 watt Inverter w/ 130 amp charger and a 20 Kw Generator that costs $10.12 a hour to run. The biggest thing I have on the inverter is a microwave that I run from time to time. The Honda EU 2000 will do the same thing for $.64 cents a hour. With the 20 KW it charge's my bank back to 80 % in 1.8 hrs ( $18.21 ) and I do use the extra power some, I have a 4 ton A/C. With the Honda I can charge back to 80% in 3.5 hours and it costs $2.19 with gas @ 4.50 a gallon ( on the water ). I just do not need what I got. I'd like to get my bank back down to 6-8 batteries instead of 10. With the GFX I can run a 5000 BTU a/c and still live good. Somebody step up with a big test. You can also stack as many GFX's as want up to 10 with a hub, So it's scalable. Even though 1300 watts seems small, that's continuous output. It's rated @ 1800 watts for 30 minutes and 2900 for 5 seconds. The GFX is a sealed unit, it can be converted into a Vented unit with a new case top or with some machine work on the mill. If venting runs true with their other models that would add another 600 watts to it's potential output. Thats my next project, I have the case top with a fan coming. The de-rating is because of heat build up. I forget to mention the GFX series comes with a 5 year warranty. Maybe somewhat of a misunderstanding. I'm not advocating having an overly small battery bank. But in our example, we have 1200 ah, or about 58 kWh of battery power. Oh, I think I see the misunderstanding, Chris. The ratio of my generator capacity to my battery capacity is very very different from yours. Your battery & inverter can handle almost anything you throw at them, but its good to have the generator come on (AGS) and help relieve the battery's voltage sag. In my system the battery cannot supply as much power as my inverter can easily handle. If the sun's not shining (and sometimes if it is) I start the generator before using power tools, shop vac, etc. If I needed more power than my generator can produce, I would rather buy a bigger generator than buy more battery capacity. My battery capacity is adequate for our domestic needs. I didn't want to supersize my battery bank just to handle intermittent use of shop tools, especially since I must have a generator anyway. I don't think generator support offers very much for my situation... but that is because the ratio of my generator capacity to my battery capacity is so much higher than yours. VT, I am just guessing that there is some kind of a ratio of Generator to Inverter to Battery Capacity that one could make a size system that would work best. Like a 3500 inverter might need a 3000 watt Generator. One might be able to use 2 Honda EU 2000's slaved together ( $1700 ) or a EU 3000 ($2,000 ). With the two generators you could just use what you wanted and you'd have a spare or keep the hours of use balanced. I kind of knew where I wanted to go before I started, if it worked. Do you have grid power ?? I'm not sure why you think Outback would not support it - their support has a stellar reputation and my one dealing with them confirmed this for me. From what I hear Xantrex/Schneider support is poor at best. Sounds like you spoke to a poorly informed Outback rep and are generalizing. True that Outback has not promoted this feature but it is documented in G inverter manuals and it has been around for a few years now. Outback has several models of G inverters with probably many thousands currently in daily use - (mostly by people who do not read this forum)- not sure why you think it is unproven. Surely the Xantrex XWs with all their problems (and one past recall) have not proven more reliable. It is true that the G inverters require very clean generator power to sync and are more picky than others - but if you're trying to be efficient in your fuel use and not oversize your generator - the Honda or Yamaha inverter gens are hard to beat anyways. Judging by the number of off grid folks here who use them, others agree. I fully agree with your opinion regarding the benefits of generator support. You've found a nice solution with your new-old Xantrex/Trace SW inverter - surely one of the best every made. But for those who need a currently available and supported inverter with generator support - I would think the Outback G inverters would be at least as good a choice as the poorly supported and bug prone XWs. BTW - the G inverters could only try to sell power back to the generator if one specifically enabled selling to the grid (this is not a default setting). Why would someone do that who is off grid? So perhaps a theoretical concern - but in practice not a real issue. Now, the Magnum inverter that is apparently on the drawing board will probably be excellent and may soon prove to be the gen support inverter of choice. No sir. I believe the rep I talked to was very knowledgeable and he flat out told me that the GVFX3648 was not the inverter to buy for off-grid power and it does not have generator support. Getting it to work in a test situation with controlled conditions vs having it work day in and day out when you live off-grid and throw everything, including the kitchen sink at it - and it had better work - is two different things. We're talking running loads of 50-70 amps on a regular basis, in our situation, and it has to be as reliable as the sun coming up every day. You're saying the GVFX/GTFX can do it - Outback told me no. The GFX and the GVFX/GTFX are not the same inverter. If you read the manual for the GFX it states that when the gen support option is selected it prevents the inverter from trying to sell power back to the generator and it accepts a wider range of gen input voltage and freq. The GVFX/GTFX do not have this. I guess if you believe the GVFX/GTFX is supported by Outback for generator support I would suggest calling them and see what they say. Tell them you live off-grid and want to use one, or a stacked pair, with generator support - that's what I did. I don't care how stellar their support is - they're not going to support something that is not designed for a particular application. I was told the GVFX is not designed to be used with a generator at all. You're saying the GVFX/GTFX can do it - Outback told me no. Well Chris that right there tells me whoever you spoke with was misinformed. It does work on my GVFX. Not sure why you're so adamant about something you have no direct experience with. And no, I have not called and asked Outback support if this feature is available - no need to -The option is on my Mate - I've tested it and it works. Right... "Generator support" actually "sells" to the downstream loads and helps out a generator that is too small for the load. At the moment, the GFX/GVFX grid tie inverter requires a VERY good generator with good frequency and voltage stability to work in this mode. We are working to make funky generators work better with the grid tie inverters. For examples see This Brochure Or have a look at the FP 1 installation manual (the FP1 is available with GVFX and GTFX inverters) Page 16 states "Grid interactive inverters typically require inverter-type generators". But it is true that you can find other Outback literature that contradicts this. Their documentation is a mess as i stated before. Bottom line is it works - and works well as long as you have the right generator. The GFX and the GVFX/GTFX are not the same inverter. Well, yes the GFXs are lower power units. But they are the same with respect to gen support. How do you know this? I'm fairly certain they are identical in this regard as well. Why do you think they are different? I guess if you believe the GVFX/GTFX is supported by Outback for generator support I would suggest calling them and see what they say. Tell them you live off-grid and want to use one, or a stacked pair, with generator support - that's what I did. I don't care how stellar their support is - they're not going to support something that is not designed for a particular application. I'm really confused by this Chris. What do you mean by "not going to support"?? Are you saying they are not going to fix it if it breaks - that is just not true. Are you saying that you're going to get better support from Schnieder for your discontinued SW inverter than an owner of an Outback G inverter would get from Outback? So all of the information provided by Blackcherry04 is some really good stuff because it's one more inverter that can be added to the rather small list of off-grid units that have generator support. - SMA Sunny Island 5048, 6H, 8H, 2kW version, but not the 3kW unit and not the old 4kW unit. Before I am totally sold the GFX it has to pass the charger test, that is the problem I had with the Magnum " Charger Over Shoot " if you set it for 30 amp DC output it would run up to 70 amps and overload the Honda EU 2000, it would surge and then the charger would run up to as high as 142 amp DC output, then it all shut down because of faults. Then you had to start every thing back up, all the loads and shut the generator down to clear the fault then re-start it. It was a endless loop of misery. One big pain in the backside. The the Magnum MM 1512 pretty much useless for $900. I see nothing wrong with Outback taking a stand and saying, our Inverters are best supported by Honda generators and setting everything up to work with them. All it takes is a little ramp up here and there and it would make it seamless, all the mechanical stuff it already there. This forum is a force to be reckoned with, we should take a stand and demand that Manufacturers listen and deal with the ones that do, NAWS can take a stand and pass on how members feel. Because I took the time to actually call and talk to Outback about it. There's a difference between something that may work under a certain set of circumstances vs something that is fully supported. I call Outback and tell them I live off-grid and I want a new 48 volt inverter that does generator support. They tell me to buy a GVFX3648. I get it all hooked up and find out generator support does not work with it. They either refund my money, fix the unit I have so it does work, or replace it with one that works. That's called a "supported feature". When I find out it doesn't work and they tell me that it works with some generators but not with others - so try a bunch of different generators to see if it works, and for off-grid with generator support I should've bought a Radian instead, that's called an "unsupported feature". Gen Support on Grid Tie units isn't quite there yet. Unless somebody else calls Outback to verify this, or one of their engineers chimes in here and says generator support is a supported feature in the GVFX/GTFX, it does not make it to the list of elite off-grid inverters that do it. There's a difference between "works sometimes" and "works every time". People who live off-grid have very little tolerance for "works sometimes". Maybe I am wrong here , If the GVFX or the GTFX accepts the programming from the Mate and it accepts " GEN " as a source and it accepts the " GEN " settings and limits it is using them, right ??. The .PDF's on the outback site are ancient 2005-2007. The manuals that just got are dated October 2010 and the Mate Manual is August 2011, but they do not say much. It's easy to tell without overloading it, when you hook the Generator to it, if it runs up to the the limit you have set for the charger it is at least doing one part of Generator Support. If it hasn't accecpted them, it'll fault the Honda EU 2000. I think you could also limit the AC output.
" Tall Girl " had a post in Outback Forum to make sure the " Sell " is off. I think that is disabled when you choose Gen as the source. It appears to me that Outback's stuff is poorly documented and a shambles compared to Schneider/Xantrex. I think anybody that wants to use with a GT/GV for an off-grid application with generator support needs to call Outback and verify that it is a supported configuration. 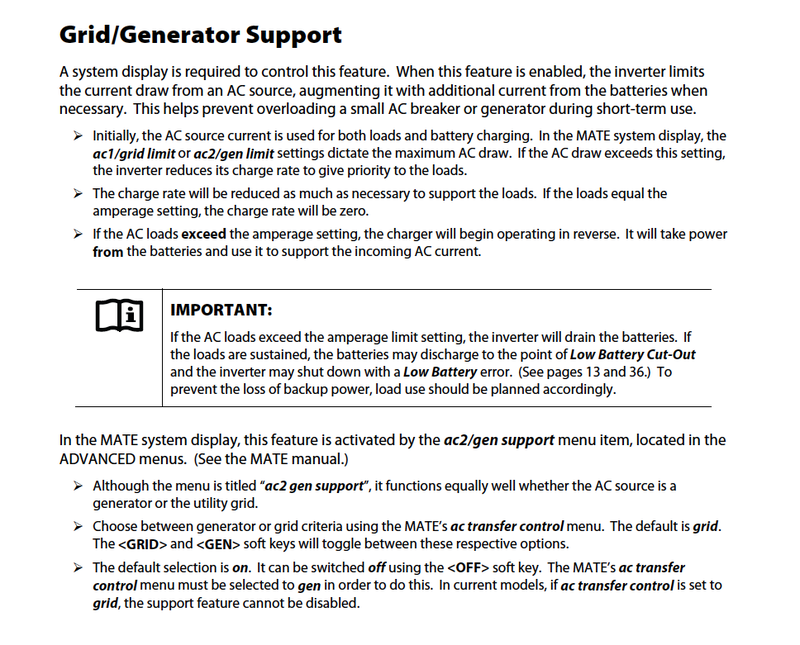 And even then, according to what I am understanding here, you're going to get somebody that "doesn't know what they're talking about" - because I was told by Outback Support that it is NOT a supported configuration with those inverters, and others insist that it is. That's one of the reasons we decided to not touch an Outback inverter with a 10 foot pole for our system here - as well as Outback's failure to support anything but two-wire auto-start generators without an aftermarket Atkinson controller. Well, I liked what I got enough to buy another one this week. It'll be nice to have one in the box, seems like everything these days, if you find something good, next time you go to get one, they either went out of business, quit making it or moved to China. Chris, you probably know what a " Hoof Governor " is, try to buy one these days. Good thing I have a stock of parts. Are those little GFX's stackable? Yeah, I got a couple Pierce belt-drive governors off from old Chrysler 225 slant sixes that were used in industrial applications back in the day. Because I took the time to actually call and talk to Outback about it. Apparently speaking to one Outback person trumps personal experience in your mind. I'm sure if I said I spoke with someone from Xantrex and then reported as fact that something you do with your SW is not possible you'd agree it wasn't??? As you've pointed out gen support is a feature for occasional short term loads. It does that on Outback G inverters, period. Ok, now I get it. You seem to have associated people saying their Outback G inverters will do gen support with saying you should have bought a Radian? Well, I certainly don't think that. You have a great setup and the old SW inverters appear to be one of the best ever made - and it is less particular about which generators it can work with - no doubt about it. As previously shown, Bob directly stated that it works with GVFX inverters as long as you use a generator with clean enough power. I'm really not sure why you're resorting to deception to prove a point you have no direct experience with Chris. Anyone can do a search of the Outback forum and see other examples of gen support for G inverters sited. Not exactly. That is from the October 2007 programming manual. More current documentation contradicts this. This is from the October 2010 GFX Operators manual that came with my inverter. There does not exist an equivalent up to date operators manual that is specific to the GVFX inverters. I asked why when i first got my inverter and was told they are functionally equivalent. I could go on but there's no point. As I previously said, Outback's documentation of this feature is poor, inconsistent and sometimes contradictory. What counts is direct experience. I suppose I could do a video showing it working on my system and maybe I'll do that sometime, but I'm sure that would only lead you to say it only works under certain circumstances. I and others have done gen support with these inverters. If it was something that was not reliable I would think that the Outback forum or this forum would have people posting such examples since these forums seem attract people who are suddenly having problems with something that did not previously work. Of course I could be wrong and others can chime in if they have direct experience with this feature not working with their G inverters. Continuing to site one conversation with one Outback rep does nothing to further the discourse. Maybe I am wrong here , If the GVFX or the GTFX accepts the programming from the Mate and it accepts " GEN " as a source and it accepts the " GEN " settings and limits it is using them, right ?? Correct, this is true on my inverter. The .PDF's on the outback site are ancient 2005-2007. The manuals that just got are dated October 2010 and the Mate Manual is August 2011, but they do not say much. It's easy to tell without overloading it, when you hook the Generator to it, if it runs up to the the limit you have set for the charger it is at least doing one part of Generator Support. If it hasn't accecpted them, it'll fault the Honda EU 2000. I think you could also limit the AC output.